to try and quieten the 'rebels' down i have cleaned up my studio space...i have also made an attempt to sort 'the bedroom'. so i ended up lugging most of the boxes down to the garage to make our bedroom feel a little less claustrophobic, plus i was beginning to worry if a minor earthquake hit it might take a while to find me. i could make the headlines "it's a miracle. after ten days, woman found buried, still alive under a ton of Lego"
my man is also objecting to my 'fabric cupboard' that looms over him as he sleeps, he has mentioned that it is the last thing he sees when he goes to sleep and the first thing he sees when he wakes up..."put it this way Tif, it is attacking me...i can deal with 'it' everywhere else but not next to me as i sleep" fair enough. so i decided to place wallpaper behind the glass doors to create a more 'clean line' affect...i have managed one door so far. I can't understand your mans problem! I think your fabric cupboard is lovely. I wish I could come and rummage through all those neatly folded piles of gorgeous, scrummy...I digress! I have a solution to your man's problem - change sides. You sleep on the fabric side. I would love to wake up to a wall of neatly folded fabric. Obviously it would never belong to me as my fabric stash looks like a pile of ironing abandoned in a heap. Nice bit of paint work on your front door by the way, and lovely wall paper. I've often thought that your family must be very indulgent of your passion for vintage and lacy things, your style is fabulous but I can't quite see it working in my house! My lot are so messy and have no sense of style, I can spend time arranging things in a pleasing way and Husband will come in and dump the contents of his pockets on my glass cake-stand, or drape his painting trousers over my freshly made bed! I seem to spend a lot of time re-arranging, in the end I've given up! I'm never going to have a stylish home like yours, oh well I'll just enjoy looking at yours. 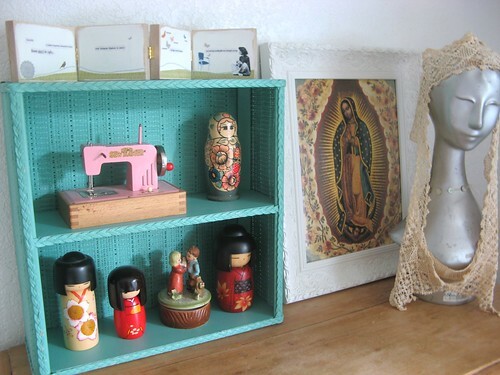 Your bookcase of fabric is so lovely to my eyes! But, I understand, my hubby would be the same way too. Love the curtains in the windows flanking your front door btw. They just do not know how lucky they are , to have an amazing lady like you buzzing around with her yards of lace. I love everything that you have showed us. At least your fabric is not at the end of the bed and need to be removed every night to sleep.My poor fellow has had to live threw that before. remind him it is your inspiration. i love the wallpaper idea. 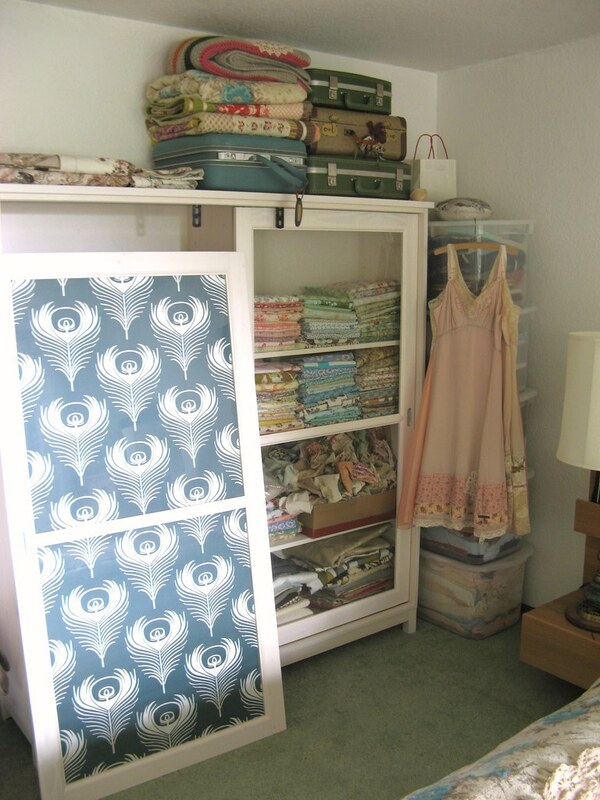 it's a lovely pattern and it's a good way to hide clutter. 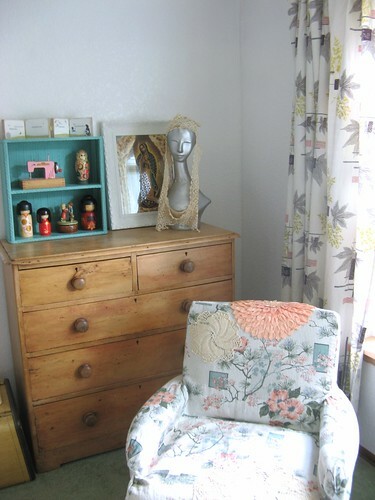 (not that i would ever dream of calling your fabric cupboard 'clutter' you understand.) I'm a big one for streamlining. You know when it all gets a little to much I love to check out your blog, your so organised, your sence of style is unmatched and it all seems to have a wounderful inspiring calming effect on me and yet you always have so much going on...how do you you do it? Oh no - what happens if your cat gets stuck in there and you can't see her?? - I'm visualising handy eye holes at the appropriate cat height :) As to that lovely wallpaper site - I'm poking myself in the head and trying not to go and look again (and again) - oh dear. I think you should make your man a non-doilified sleep mask, bless. A girl can never have too much fabric or lace in her house . . .
That front door is gorgeous! I love the dark colour and fab 'door furniture' (I always enjoy that phrase!). 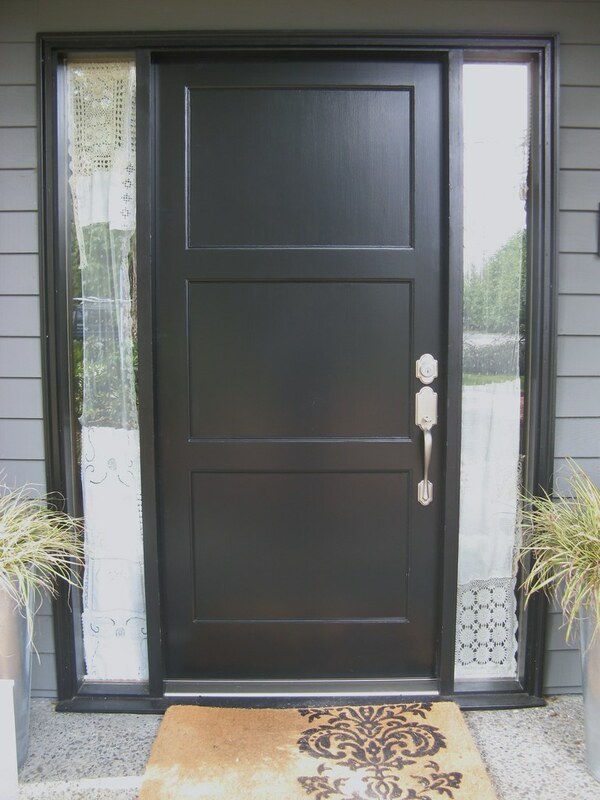 Your front door is so pretty! I love the windwow treatments you made for it.